Grabbed the Canada 150 pack on the weekend and I'm about halfway through it. I really enjoyed Yukon Brewing's Swift Currant. So much so that I emailed them and they gave me the recipe! I thought this would be a perfect beer for the warmer months when I crave something a little darker and roasty but still nice and refreshing. The only thing he didn't give me was the yeast. It had decent body but I didn't perceive many esters, it tasted pretty clean. He also said that they used natural black currant concentrate. I haven't started looking for it yet but if anyone has any input on the concentrate, yeast selection or recipe as a whole I would love to hear it! Found some of this stuff at scoop and save. 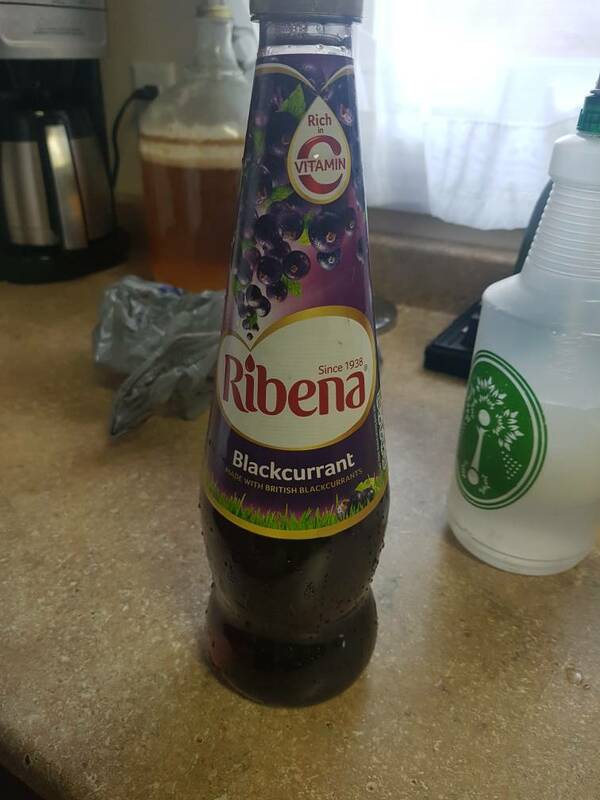 Listed as a black currant concentrate, perfect right? About ready to mash in when I decide to take a gravity reading of the concentrate for curiosity. Turns out my hydrometer and refractometer only go to 35 brix. Whoops. Looks like I'll just add the 350g and hope I get it right, haha. You could dilute it with water to get something that will register on your meter, then back calculate to figure out the gravity of the juice. Just kegged it today. Since I've started batch sparging I've been way overshooting my numbers and this was no exception. I got an OG of 1.060 and it finished at an ABV of 6.3%. Because of this its a little boozier and not as light as I would have wanted but I think with some additional aging it will be perfect. Its still pretty close to the mark for what I was going for in terms of flavour profile. Fruity and roasty but not to the point that either overpower the other. Interesting, this might be good in a saison as well. Hmmm...you might be right. I've always wanted to try a dark saison and I still have a big bottle of this stuff to use. When are you putting this in? Secondary? During fermentation? Or just before kegging? I added it around 4 days into primary. The brewer told me they added it just before attenuation and I wasn't really sure how to accurately measure that so I went for when fermentation appeared to slow down.